Burgundy (dark red, red wine color) is actively used for hair dyeing in brunettes. Blondes and women with medium brown hair sometimes also resort to this noble hue in order to appear brighter, well, much brighter. Even redheads may try some shades, reminding burgundy, but leaning towards the warmer tints with admixture of cinnamon. Classic, vivid or old burgundy, maroon or oxblood… so, which one to choose? Here are 50 illustrative examples of how you can use the dark red color, when dyeing your hair or refreshing it with coloristic methods. It livens your tresses, adds them a mysterious undertone or, on the contrary, the boldest shade you could ever imagine on yourself. Burgundy adjusts to your basic hair color and lets you achieve your goals. Do you want to be in the centre of everyone’s attention? Create a smart retro look? Add a pop of color for the fall period that will look in tune with nature changes? Introduce some spice tint and shimmer for your brunette locks? No problem, look through the pictures below and choose. Initially burgundy hue was considered a perfect shade for real brunettes. These days even some blondes dare to go that bright and eye-popping. If a step towards bold vinous color shades seems too challenging for now, but you are tempted to try something revolutionary, consider ombre in red and purple tones with demi-permanent dyes. They wash out after 24 shampoos, so you won’t get bored with your flashy ends. This idea looks pretty cool on medium brown hair, for instance. Vinous highlights, as another compromise solution, are ideal for black, dark-brown and medium brown hair. Well, let’s see some pictures. Softer and less noticeable than the traditional ombre effect, balayage is one of the latest color trends that emulates the hair naturally lightened by the sun. Combine this trend with the burnt red sunset hues for a standout, artistic look. Displaying that burgundy purple hair you invested in is easier than you think. Give yourself a sleek, silky blowout and let the hair dye really shine. Just use a round or paddle brush and run it through a section of damp hair while following it with a blowdryer. Dark red violet locks are about as close to natural-looking hair as you’re going to get, without actually going natural. Try a shade that sports a subtle purple tinge that isn’t incredibly noticeable… until you stand in the sun. Then, watch the sparks fly. Purple hair often brings up images of fluorescent violet locks. Go another direction and try deep, dark purple hair instead. This look is great: the rich shade is versatile enough to take you from summer to fall seamlessly. Give your purple red hair a dreamy, ethereal edge by wearing it with jewel-toned highlights. The glistening strands of color will look positively enchanting and give “unicorn hair” a whole new meaning. 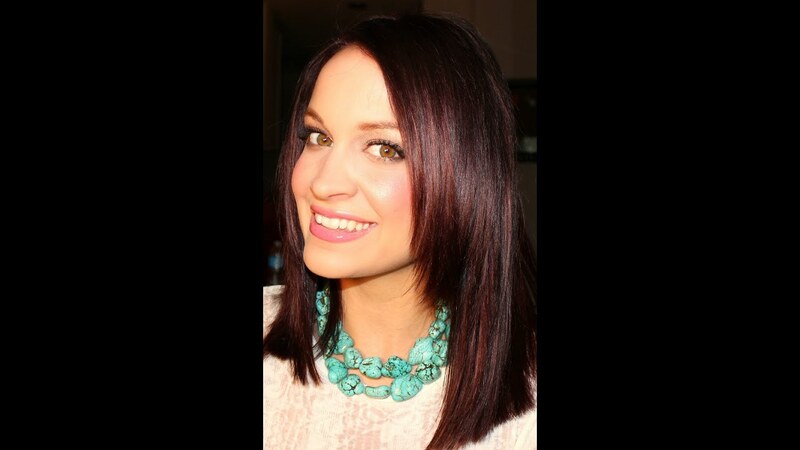 Get playful with your hair color with maroon locks that pack a punch. The color is not quite red and not quite purple, but totally mesmerizing. Go ahead and try it and see if you aren’t drowning in compliments immediately. You can easily achieve burgundy hair by adding some red wine highlights to an espresso base. This creates a beautiful reddish purple hue that looks unbelievably striking when it catches the light. If you like your deep brunette hair and want just a hint of red wine hair dye in your locks, no need to commit to a solid burgundy hair color. Throw in some very subtle balayage highlights to make your mane dimensional and colored as opposed to neutral. This more subtle dye job looks fabulous all year round with practically any complexion and outfit color palette. Long, slick amethyst-colored hair is the stuff of dreams. Make it a reality by dyeing those long locks a crimson purple hue and letting them just hang down naturally. No muss, no fuss. The perfect all-over burgundy color, these tresses have been tinted to create red brown hair that makes the ultimate style statement. The good news is that this shade looks distinctive whether you have short or long locks. Incorporating purple into your brown tresses is more daring and alternative compared to red burgundy. Less natural-looking and more fashion-forward than the traditional burgundy tones, it looks particularly breathtaking when paired with a choppy lob. Two-tone and slightly more alternative, black burgundy hair provides a captivating contrast for brave, experimental individuals. To create a more synergized look between the two colors, opt for a balayage technique. To enhance the brightness of your burgundy tresses, you can ask your hairdresser to incorporate some spicy red highlights into your ends for a rather subtle look with a difference of tones. Due to the two-tone effect, it also makes your root hue appear shinier and healthier. Result. If you’re new to burgundy locks, you can experiment initially with reddish brown hair. This can be achieved, for example, with a simple balayage through thin subtle ribbons of color applied over your natural brunette color, without previous bleaching. It’s one of the best burgundy brown looks for beginners. For a unique, immensely vibrant style, you can ask your hair colorist to adapt your tresses to the spectacular clash of magenta pink and deep burgundy with the base black color. Coloring your entire head magenta will turn out too overpowering, therefore it’s all about opting for balayage. A low-key burgundy style if you already have or want black hair with a twist, purple tint is understated yet seriously chic. It usually takes more to the ends, giving your tresses a darker appearance at the roots that gradually becomes lighter as it flows to the bottom. Medium and short burgundy hair can certainly be just as impressive as longer styles, especially if your locks are particularly rich in hue. For instance, this highly pigmented plum color enhances your features and ensures that you can easily be spotted in the crowd for all the right reasons. Completely different to having brunette hair with burgundy highlights, the dark chocolate and cherry hues create a tasty combination that’s a treat for the eyes. Ask your hairdresser for subtle cherry highlights on dark brown hair for fun and quirky locks. You can opt for a subtler balayage solution if you feel like trying a more muted alternative to the dark chocolate and cherry coloring listed above. Still undeniably beautiful, it’s better suited to those who already have rich chocolate hair and want to add a bit of extra flavor to it. If you have black hair, simply add warm brown and burgundy red highlights to develop a cool and unusual color resembling dark maroon. The variation of hues means that it doesn’t look as brash as other effects, but still seriously chic. Classified as one of the boldest burgundy looks, black hair with a red ruby balayage is incredibly bright and sure to turn heads. It’s not for the faint-hearted, but all you need to successfully rock it is confidence. There are some instances where burgundy and brown make for the ultimate power duo, and this is certainly one of them. Add some soft merlot tones to the ends, along with some defined curves using a curling iron, for the cutest wavy balayage effect. If you’re a fan of dark red hair, perhaps this burgundy shag is for you. Designed to look messy and carefree, this hairstyle is dazzling when combined with copper babylights, which is a very fine color technique mimicking hair that has been naturally lightened in the sun. You can easily and quickly achieve subtle red purple ends just by applying the balayage approach to black hair. Softer and more natural-looking than an all-over color, this style epitomizes class and elegance while still being out of the ordinary. Put a contemporary, edgy twist on your tresses by embracing rose pink and burgundy highlights. If you ask your hairdresser to make sure the colors are well-blended, the result is a washed out maroon red effect that has pretty pastel tones. A modern update for your brown burgundy hair, you can add touches of copper to create the perfect maroon purple balayage. Maroon hair looks particularly sensational if you naturally have dark hair and dark brown, green or blue eyes. While pastel, cotton-candy hair is all the rage right now, don’t underestimate the power of classy dark burgundy hair. When layered and styled to perfection, it is just as bold and just as eye-catching. So drop your pink hair dye and swap it for a crimson hue. Create a colorful contrast in your dark hair by choosing burgundy highlights. And to really show them off, pair them with a simple, sleek, straight style that lets the color do the talking (and this one’s saying “Berry beautiful!”). 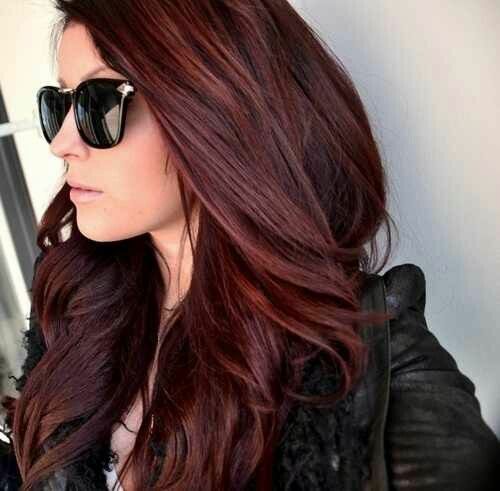 Rock red and brown hair the right way by letting the two shades overlap into ribbons of color that rush down. When blended well, the two shades create a mosaic-like effect that’s simply lovely. You don’t have to dye your entire head to enjoy the perks of burgundy hair. Take baby steps to burgundy by dying the ends and front pieces in slightly washed out reddish purple shades. The flash of color is still dynamic and totally bold. The mermaid look just got real. Maroon hair color, when rocked with a metallic finish, is downright fabulous and perfect for those with fairer complexions. The cinnamon-y red will contrast nicely with your ivory skin and make you look like you’re ready for life under the sea. Look closely at this burgundy hair color and you’ll see tiny hints of blonde peeking through. These babylights turn the burgundy shade on fire, and the choppy cut with varied lengths just lends to the flaming look. When it comes to reddish brown hair, sometimes you have to go big. A great way to do so is by giving yourself some beautiful, buoyant barrel curls. Use a 1 ½-inch curling iron to curl sections of the hair outward, away from the face. The perfect example of burgundy brown hair, these luscious curls must have come from a bowl of chocolate and cherries used as a dye, and the result looks so good we want to taste. Medium length textured waves are trendy, but make them stand out even more by infusing some cranberry highlights into the mix, because unlike canned cranberry served at Thanksgiving dinners, this is one sweet berry option you shouldn’t pass by. Long, shiny, bouncy curls – this stunning mane was made even more striking with a deep mahogany shade. And the best part about burgundy shades like this one is that they’re professional enough for work, but unique enough for you to stand out. Two colors in one, this dark mane was transformed into red brown hair with the magic touch of a talented stylist. The ombre effect makes it look as if her natural dark locks are melting in a magic burgundy pool, and we want to dive in! Burgundy hair looks very stylish with black clothes and accessories. Opt for solid classic dark brown tone with very subtle or even blonde highlights for your most voguish looks. The burgundy that leans towards the blue palette is charming, unquestionably. If you happen to have blue eyes or simply have a passion for blue shades, you may adopt this idea for your new hair color. Burgundy blends with red maroon as well, same like port and claret with spices on a frosty winter day. This interesting coloristic idea is performed with the balayage technique, when the color is placed strategically on larger sections. Some girls shy away from the burgundy hue when picking hair dyes, simply because they think of something gaudy. But red wine can be very “calm”, elegant and decent like this gorgeous shade with random cherry wood highlights. If you want to accentuate your femininity and passionate nature, try the chestnut burgundy like in the photo. It looks fabulous on the long curled locks! Don’t forget to use professional products for dyed hair to maintain the color and shine of your tresses. Give that thick, black hair a nice little upgrade by throwing some burgundy highlights into the mix. Weaving the hue into the bottom of the hair delivers color that’s unexpected and unique. No one will ever dare to call you boring. 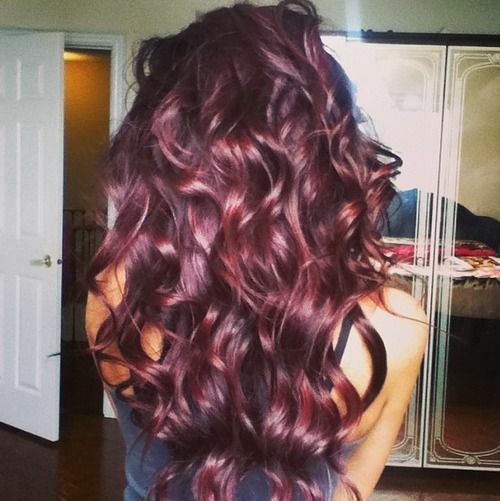 Burgundy hair color looks best in ringlets. You heard it here first. If you have especially long locks, try curling the very ends of the hair so your hair looks like some deep burgundy crashing waves. The results are fabulous. If you’re a balayage fan, meet your perfect burgundy-lock option. Painting random strands with this rich, jewel-toned color is the best and most beautiful way to make your waves pop. And this particular shade has us feeling extra giddy – bookmark this image to show your stylist! Adding burgundy to your hair can be intimidating, but there can be a middle ground and this shade is it. The transition from deep chocolate at the roots to soft burgundy towards the ends is subtle, resulting in a burgundy brown shade that’s reminiscent of the two favorite things of the average girl: chocolate and wine. Going burgundy already takes guts, but if you’re feeling extra bold, you can kick your dark red hair up another notch by pairing it with a sassy cut, like this choppy bob. Note the subtle ombre effect, melting from deep burgundy roots into a brighter red shade towards the ends… there’s nothing boring about this burgundy bob! Well, we hope you have found your favorite red wine tint with a cooler or warmer base that tastes and feels the best. Burgundy is flattering for practically all skin tones. You only need to carefully select your perfect shade.